You Mean White Is Imbalanced? The Dress - the great instigator of Internet debate! All of it could have been avoided with some white balance adjustment, but what fun would that have been? White balance is an adjustment made either on-camera, or in photo editing software during post-processing, that changes the rendering of colors. The adjustment re-maps colors from their original digital values to new ones. That's the functional way to look at it. The technical way gets into black body radiators, mireds, electromagnetic radiation, and other sciencey stuff. White balance is one area where the tools don't do a complete job of abstracting the science behind photography. But I don't think is has to be so sciencey1. Having a very basic understanding of how it works, but a deeper functional understanding of what the tools actually do visually and when to use them, is just fine for most photographers. So I'm going to write in Laymanese as much as I can in these posts. So, white balance allows you to adjust the way colors look. Why would you want to do that? The most common reason is that the colors of a scene captured by your camera are dependent on the light that fell on the scene. This is obvious with something like stage lighting. Shine a red spotlight on a person and she is going to be tinted red. It's more subtle ‒ but every bit as true ‒ for the regular indoor and outdoor lighting you have all around you, including the sun! The perceived color of an object changes depending on whether it's lit by, say, sunlight, an incandescent bulb, or a fluorescent light. There are relatively few light sources that output pure white light in the world. If you're observant, you can consciously see it, but you often don't because your brain does a phenomenal job tuning out the color cast from light through a phenomenon called the memory color effect. The memory color effect gives us the ability to look at a cerulean blue object under all kinds of different lighting and recognize that the object's actual color is cerulean blue, like a gentle breeze. But the color cast is still there and your brain isn't necessarily as good at tuning it out when it's rendered in a photograph. Ever noticed that photographs taken indoors without flash can be tinted yellow, orange, or green? That's the color cast from the available light in the room and it was there when the photo was taken. Looking at a photo is not as immersive an experience as looking at reality, so your brain usually doesn't turn on its color calibration feature. Science has given us the ability to measure different types of light sources by color temperature. The technical definition of color temperature is so sciencey that I'm not even going to bother with it. As a photographer, I think it's more useful to think about color temperature as a measurement of the color cast the light produces. Color temperature is measured in kelvins, which is literally a temperature scale like Fahrenheit or Celsius. Those kelvins specify the amount of color tint imparted by the light source. Unfortunately, the temperature values in the table above are not exact but generalized values. Not only does color temperature vary by the type of light, it also varies by the age of the bulb and whether the light is shining through a fixture or shade. So not every soft white incandescent light source is going to be exactly 2550 K. And a given room is likely to mix multiple light sources of various type, age, and treatment. In the case of sunlight, color temperature varies dramatically by time of day, the season, latitude, cloud cover, and shade. 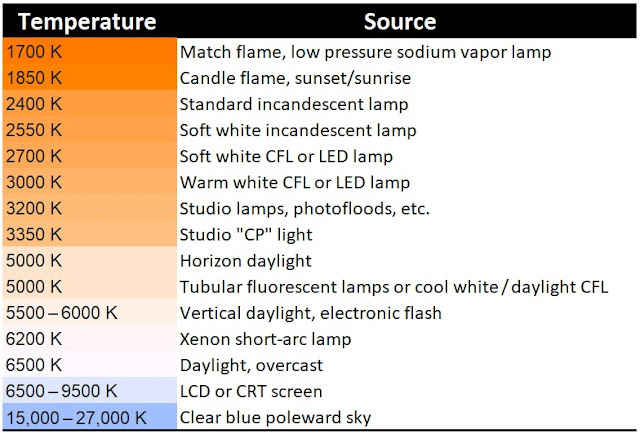 In other words, real world color temperature is a complicated, multifaceted, moving target! That's the deal with photography: the world presents you a complex, ever-changing, highly interdependent set of variables, and your job is to find a perfect fleeting moment in time, wrestle all the complexities to the ground in an instant, and capture the moment in a picture. White Balance To The Rescue! Fortunately, for the color temperature complexity we have white balance. White balance can be used to remove (or amplify) ambiguity about the color of things. 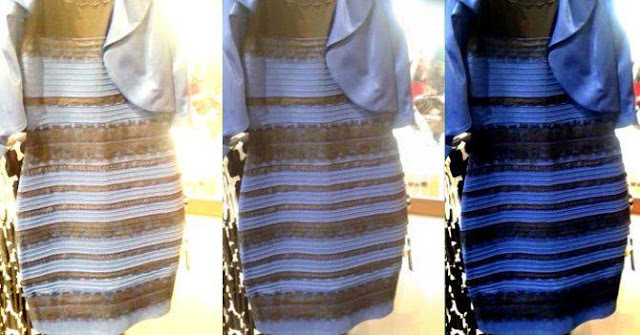 If the photographer of The Dress had applied some judicious white balance to the photo, the entire meme would have never happened! Just think about how many arguments that would have avoided. So white balance is also an instrument of world peace. Next: In part II of my white balance posts, we'll talk about how and when to use white balance, both on your camera and in your photo editing software. 1. Now don't get me wrong. Science is badass! It's what makes all this stuff possible. And I usually prefer knowing how things work at as deep a level as I'm capable. But often technical accuracy and detail is unnecessarily obfuscating and gets in the way practical application. Especially for creative types.